One critical precondition for successful urban cycling systems: get rid of the helmet laws. I maintain that helmets are for extreme sports, activities where you are likely to injure yourself. If bicycling around a city is really that dangerous, there’s something deeply wrong with the city’s infrastructure – and if it’s not that dangerous, why require people to wear helmets? I’ve never worn a bicycle helmet. I haven’t really ridden a bicycle since the helmet-law craze kicked in, either. Repealing the local helmet laws would go a long way to making me think of a bicycle as a normal mode of transportation, a machine I could use to run errands and visit my friends, instead of just a piece of equipment for an extreme sport I don’t happen to enjoy. Of course I’m not talking about high speed cycling for sport, here – if you’re flying along at two-lane country roads at 30 mph a helmet might well be worthwhile. I’m just talking about the sort of “maybe I’ll take a bike to the store instead of driving” trips that would make us all healthier and less oil-dependent. We should be promoting that kind of thing instead of scaring people off by telling them it’s so dangerous they need a helmet so they won’t die. 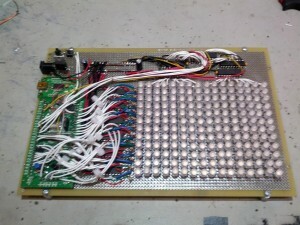 I completed the prototype of the cylinder controllers for Michael & Likhita’s chandelier. It was a ridiculously labor-intensive project. I thought it would be a good idea to make a full scale prototype before committing to the PCB manufacturing run, in order to catch any mistakes, but it was such a laborious, error-prone process that I think I’d have done better to just print the PCBs and redo them later if they turned out to be unusably broken. Google’s Android file transfer app has an incredibly annoying habit of popping up every time you plug your phone in, whether you want it to or not, and there’s no preference to make it stop. This might be fine if you only ever plugged your phone in when you wanted to transfer pictures, but I use my Mac to charge the phone, too. Here’s how to disable the behavior: it’s a bit finicky, but basically there’s a little “agent” app that does the auto-launch, and the Android utility app installs this thing as a login item every time you run it. So you have to delete the login item *and* rename the executable, thereby preventing the Android utility app from reinstalling the agent. – If “Android File Transfer” is open, tell it to quit. – Use Activity Monitor to force the process “Android File Transfer Agent” to quit. – Right-click on the “Android File Transfer” application and select “Show Package Contents”. Go into Contents > Resources and rename “Android File Transfer Agent” to “Android File Transfer Agent_DISABLED” or something of that sort. – Go to your user home directory and open Library > Google; if you see another copy of “Android File Transfer Agent”, rename it similarly. You will still be able to open “Android File Transfer” by hand any time you want to look at the files on your phone: it just won’t pop up automatically every time you plug the phone in to charge. Simtec Electronics offers a USB device called the Entropy Key: a PN-junction-breakdown based hardware random number generator.They’ve done what appears to be a solid job engineering this thing, with multiple independent entropy streams used to crosscheck the actual randomness of the output. The SSM2166 is an integrated circuit which implements a single-channel preamp with adjustable compression and noise gating. Stick this on the input side of an ADC, in other words, to get a clean, predictable audio input. I might be done with Burning Man. There’s this thing with altered-reality experiences: they don’t last forever. You gain some new perspective through them, you acquire an expanded sense of what is going on in the world, but repeatedly pursuing those experiences doesn’t continue to expand your perspective. It has something to teach you, but once you’ve learned the lesson, what do you do with it? I’ve been to nine burns, starting in 2001. The first was difficult, stressful, not a lot of fun, but it planted a lot of seeds. The next couple of burns changed my life and I would not be the person I am today without them. Those experiences stretched out my awareness of life possibilities and gave me a sense of purpose around the creative arts. Then there were a few years where I ran with that, throwing down the best I had to offer each summer. Now… why am I going back? It seems to be a cycle of diminishing returns. As the event develops, it gets bigger, thus more civilized, thus more limited, and the sense of possibility I feel when I crunch across that old dry lakebed fades into memory. I know what I can do out there, and I’ve taken that back home and done my best to build a life where I can do that all the time. When I go to the burn now, more and more I see the scaffolding, the stage set, the limits of the illusion, and the less I feel any expansion of possibility. Time to blow it all up and start over. Innovation becomes repetition becomes tradition. Time to strike out on my own. Floodland 2013. 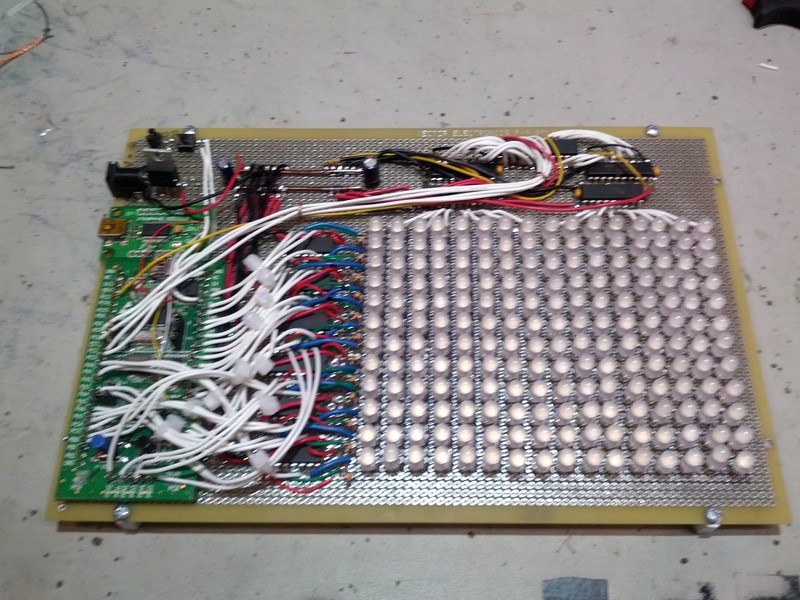 This STM32-driven 12×16 LED matrix is a non-form-factor prototype of the circuit I’ve designed for each component in the chandelier for Michael and Likhita. I’ll use it to validate the design and then to develop firmware. 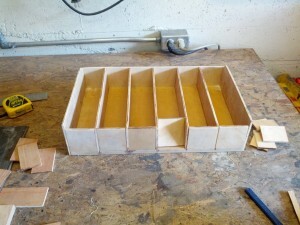 Custom card file box made from scrap wood scrounged up at ALTSpace. I’m going to delay my re-entry into the workforce by another month to work on an LED project. 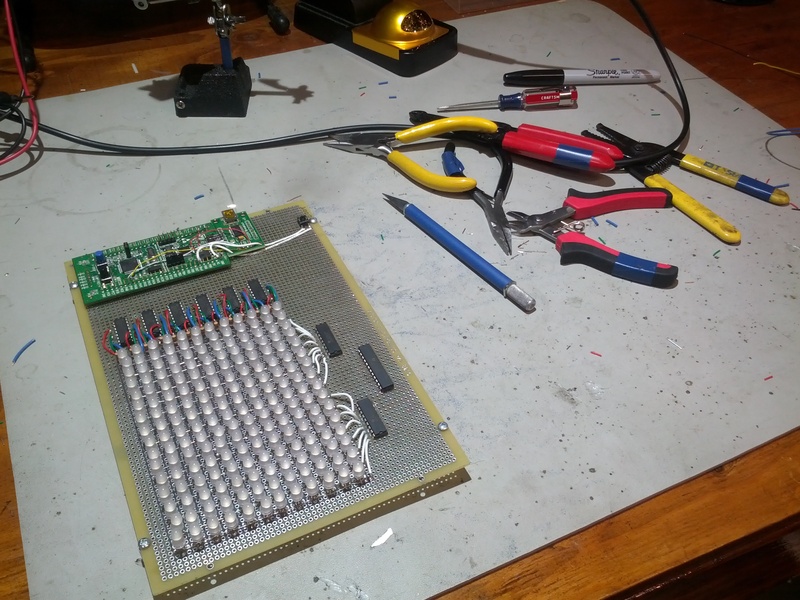 This will be the most complex piece of lighting I’ve ever attempted, incorporating 1,344 individually addressable RGB LEDs driven with 24-bit gamma-corrected color. That’s over four thousand individual control channels which have to be timed at megahertz resolution. On top of that, the display will be running an evolving, adaptive, algorithmically-generated animation loop… and the computation will be distributed across a peer-to-peer processor network. I am so excited I can barely stand it. Why am I doing this? My friends Michael T. and Likhita K. want a custom chandelier for their dining room and asked me to design it. We spent a few hours last week with a couple bottles of wine, kicking around ideas, and came up with a concept incorporating trees, waves, and fireflies… it’s going to be beautiful and unique, a little bit Art Nouveau, blown glass and wrought iron and braided copper… all powered by an array of ARM processors. Surprisingly difficult to locate in a search: most articles discussing “posix” and “regular expressions” and “grammar” discuss the use of regular expressions in parser implementation, where what I want to do is implement a parser for regular expressions themselves. Back in Seattle, typing on my laptop at the local pub. I’ve had one night of sleep on a proper bed in a motel and another at home, but I’m still feeling pretty vacant. Aside from some desultory unloading and cleaning work, I’ve done almost nothing today. Ava’s lungs really don’t seem to handle playa dust well, so she was pretty sick by the end of the week and not having a good time at all. I spent Saturday packing up the car, and we left straight after her burn-perimeter shift was over. A good steamy shower seems to have helped her; I hope the cough doesn’t linger for six months like it did last year. I’m sorry to say it was an unsatisfying week, and I’d have done better to stay home. The event itself was pretty much the same thing as ever; I just didn’t have anything to do most of the time, and what I tried to do mostly didn’t work out. My friends were scattered all over the playa, thanks to the Great Ticketing Fiasco, and Ava was too sick to spend much time walking. I went out one night in a dust storm with the KAOS art car, and there was one other walking expedition which didn’t end in tears, but there were no “wow” experiences, nothing to make this year stand out, nothing that made me feel moved or inspired or changed. Well, ok, there was a “wow” moment on Saturday night when they blew off the last round of fuel bombs in the man base, and the whole building erupted into an enormous fireball, and everyone covered their eyes and backed up as fast as they could because OH WOW IS THAT HOT. That put a grin on my face. It was a little echo of the titanic oil derrick explosion back in ’07. All together, though, I didn’t have a good reason to go, wasn’t able to find any good reason to be there once I arrived, and I wish I’d stayed home. Oh well. With nine burns under my belt I guess they can’t all be awesome.